Sometimes epiphanies come in pairs. In April of this year, on different days in different places, I happened to taste two American dry Rieslings of vastly more than routine interest. Each pushes the dry Riesling envelope in a distinctive way, with surprising results that I report here. 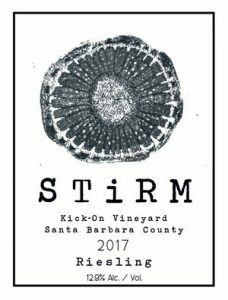 A special lot of Riesling from the Kick-On Ranch in Santa Barbara’s Los Alamos Valley; see Riesling Rediscovered, p. 333-335 for details on the vineyard. Ryan Stirm of Stirm Wine Company, about whom more is found in an earlier post on this site (http://www.oenosite.com/is-a-riesling-renaissance-beginning-in-california-chapter-1-ryan-stirm/), enjoys pushing vinous envelopes of many kinds. In 2016 he elected to experiment with a zero-sulfur protocol for part of the fruit he takes from Kick-On, dubbing it Kick-On “eøølian.” Half of this lot was sold in kegs to high-end on-premise establishments where keg wines by the glass have good visibility. Visibility aside, kegs can be advantageous when sulfur has been excluded from winemaking; not only are keg wine sold through quickly, but inert gas automatically replaces wine as the latter is removed, avoiding oxidization. The rest of the lot was bottled conventionally. My notes: Aromas of lemon and straw. A cornucopia of citrus, pear, apple and melon flavors on the palate is punctuated with sabers of minerality. A combination of malolactic conversion, long lees contact and abundant (ripe) acid creates rich texture, tension and a long bone-dry finish. This wine is persistently exciting from first sniff to last drop. 11.4°! Note that Stirm’s “classic” vatting from Kick-On in the same vintage is also excellent. Without the eøølian for comparison, the classic cuvee would have been impressive enough. In comparison, however the eøølian soared, showing exceptional purity, precision and jump-from-the-glass excitement. My notes on the classic cuvee follow: Macerated yellow flowers and yellow plum buttressed with citrus pith and a tense structure, and delicious, and a friendly 12.9°. Chalk up a goo example for the folks who have often said that “natural” wines display a brilliance lacking in their sulfured siblings.